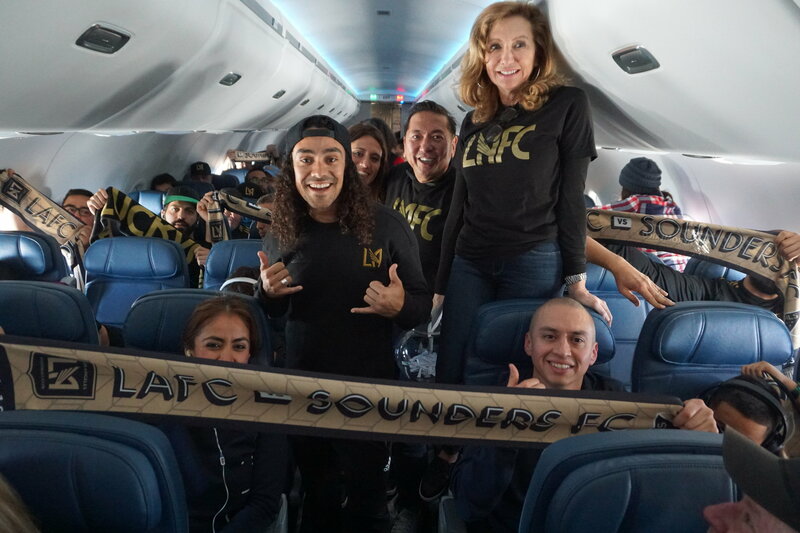 More than 100 fans of Los Angeles Football Club boarded Delta Flight 2714 from Los Angeles International Airport to Seattle-Tacoma International Airport on Saturday, March 4, for a special fan shuttle flight celebrating the team’s inaugural match in Seattle. Partners Delta and Aeromexico, the Official Airlines of Los Angeles Football Club, partnered with the team to create an elevated flight experience to commemorate the historic match. As they arrived at LAX, guests checked in and cleared security through dedicated lanes. They were then treated to a pre-flight brunch at Barney’s Beanery in Terminal 2, giving them a chance to meet other fans and build camaraderie before the flight to Seattle and the big game the next day. As passengers boarded, they received a gift bag with festive items, including a limited-edition soccer scarf, an LAFC home jersey and other items from Delta partners. During the flight, fans had a chance to win prizes and began chanting and singing in support of their team. LAFC’s inception was more than two years ago, and since that time, the club has built a strong fan base in southern California. The first game was worth the wait for those dedicated fans as LAFC came back to LA with the franchise’s first win. In January 2017, Delta and Aeromexico were named official airline partners for LAFC, and the partnership underscores Delta and Aeromexico’s continued commitment to serving the Hispanic community in LA and to be the leading transborder alliance. As the team’s official airlines and founding-level, “Golden-Boot” original supporters, Delta and Aeromexico will provide community and fan engagement opportunities and will sponsor the pre-game player walkout moment. Delta will also be highlighted through rotational LED signage at the new stadium, including in-game scoreboard features. Delta and LAFC are building a better LA together with Delta’s $1.9 billion Delta Sky Way at LAX project and LAFC’s new, 22,000-seat Banc of California stadium, which is set to open in April 2018. Delta and Aeromexico launched their first codeshare in 1994. In 2015, the airlines announced a historic agreement to establish the largest transborder alliance between Mexico and the United States, benefitting customers of both airlines. Travelers have access to a combined route network of more than 1,000 weekly flights between Mexico and the U.S., including more than 100 weekly flights between LAX and seven destinations in Mexico.